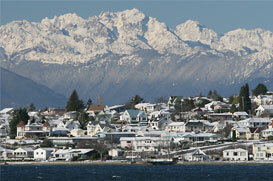 Keyport is an unincorporated community in Kitsap County nicknamed “Torpedo Town USA”. The community is located at the eastern terminus of State Route 308 on the Kitsap Peninsula, 3.42 miles (5.50 km) east of Sub base Bangor. It is the home of a small US Navy depot tasked with ranging and repairing torpedoes for the US Navy and Allies. The entire community sits on a small peninsula that juts out into Liberty By near Poulsbo. The Naval Undersea Museum is located in Keyport and exhibits many displays on undersea technology. The Trieste II which descended to 20,000ft is available for viewing in the museum as well. The local port authority operates a small marina and boat dock in the heart of the village that sports a boat launch as well. A local mercantile sits near the top of the launch where one can get fresh homemade soup, sandwiches, and ice cream. The mercantile also sells groceries and other items to the community and boaters that stop in. Another place known to eat is the Whiskey Creek Steak House which is located on the only road into town. It is known throughout the county for a place to go for great steaks and a fun ambience. The village hosts many different events that nearly everyone in the community participates in. They have their own 4th of July parade, as well as other annual event including but not limited to the annual ‘garage sale’ where anyone wanting to get rid of some of the extras around the house puts up a table in their driveway to sell their unwanted item. It may sound strange but it is advertised to the surrounding areas. You can also find many houses that have just set up a table to sell lemonade, cookies, or other homemade pastries. With a population on the main peninsula of around 600 people it makes for a fun weekend.